Here's some feel-good news for your Thursday, not to mention one of the most inspired applications of 3D-printing we've seen yet: a bald eagle with a prosthetic, 3D-printed beak. 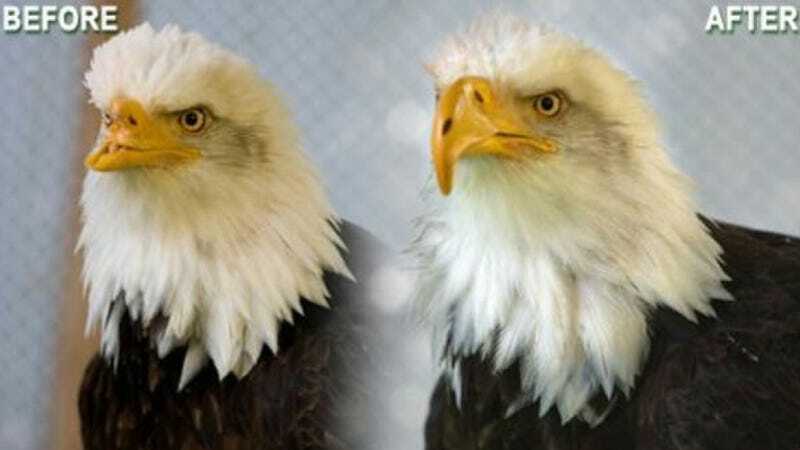 When this bald eagle, named "Beauty" by her caretakers, was shot in the face by poachers in 2005, her beak was demolished, leaving her unable to feed or even groom herself. Fortunately, animal rescue workers found her and brought her to volunteers at Birds of Prey Northwest, who have spent the last several years nursing her back to health. In that time, however, it became clear that Beauty's beak was permanently damaged, and that she would never be able to feed herself. Euthanasia, it seemed, was imminent. Raptor specialist Jane Fink Cantwell, who dresses like Indiana Jones, refused to take "dead bald eagle" for an answer. She joined forces with mechanical engineer Nate Calvin of Kinetic Engineering Group, and together with other scientists, engineers, and even a dentist, they designed a nylon polymer beak that would perfectly replace Beauty's lost upper mandible. Calvin developed the new beak using a 3-D modeling program, then used a 3-D printer to fabricate it. After an arduous procedure to attach her prosthetic, Beauty was able to eat, drink, and preen herself on her own. Damn impressive if you ask us. Read more about Beauty and her new beak over on Grist.